This is one of the most delicious and easy pies I have ever made. Itâs delicious, even when eaten before itâs baked; itâs that good! Heat oven to 350Â°F. Prepare macaroni and cheese as directed on box. Brown meat and cook with celery, green pepper and onions in a small amount of water. You can also add other seasons such as garlic and green seasoning, if you wish. Cook until tender and meat has dried out. Add meat to drained macaroni, stir in corn, tomato paste, salt and pepper. Add cheese package mix from the box; mix well. 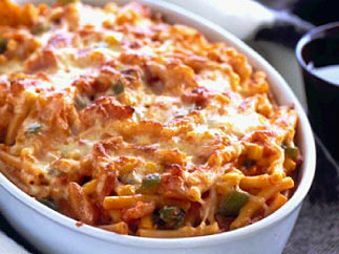 Pour into two-quart casserole dish and top with grated cheese; bake for 15 – 20 minutes. Tip â You can use tomato ketchup or even pasta sauce as a substitute for the tomato paste; just add less water if you are using pasta sauce. If ground beef isnât your preference, then feel free to use minced chicken or turkey.